I'm so excited (and very nervous!) 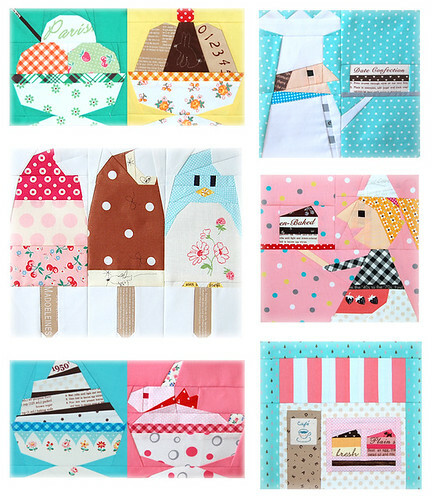 to tell you that Super Penguin QAL's September blocks are up on superbuzzy!! 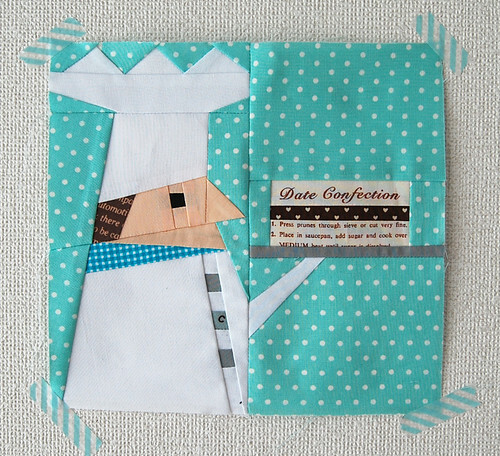 This month, we have a chef, a waitress and a cafe to go with popsicles (July block available here) and dishy treats (August block available here)! This chef may not have the coolest hair style in the world, but could he have your forgiveness? Looking good is not his priority. His focus is all about making sure all sweets coming out of his kitchen are excellent and are up to his customers standards. He made those popsicles, dishy treats and of course this baked cake on his hand! He is such a great chef! And this waitress is now on her way to deliver this piece of the cake that the chef just got out of the oven. She so enjoys being a part of this popular cafe. She may have a moment when she is air-headed, but her lovely and carefree personality is another factor this cafe is getting such a terrific review in the town. So here it is. This is the cafe they work at! Even when it's rainy out, they are busy running the business! There is one technique I used which isn't hard but was not introduced in popsicles or dishy treats so I'd like to cover it here. Basically, you'll begin with the upper part of the window. 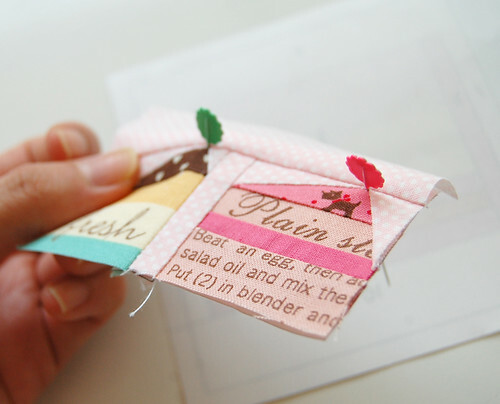 You'll sew two cakes and the piece that comes above the cakes together. 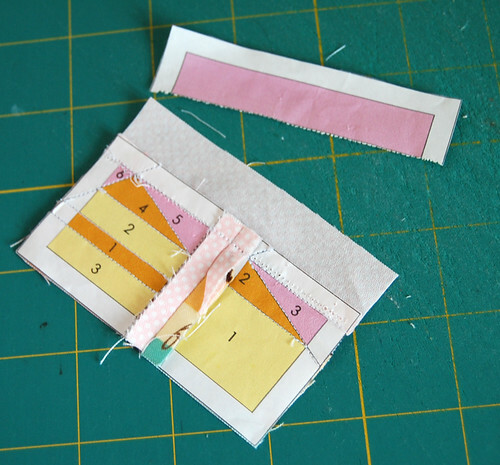 This paper-pieced block, will be treated like one piece of fabric in the next section you work on. This is the way I found it easiest! 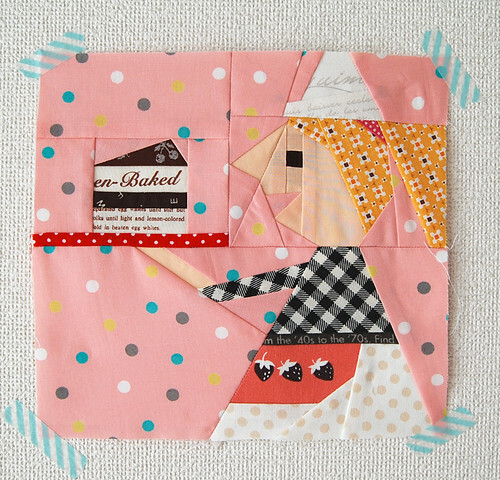 Here the cakes and the above piece is sewn. 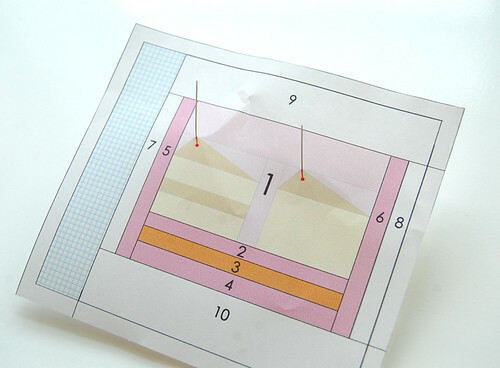 You could use the pattern in the PDF to neatly cut the fabric before sewing the top part, but if you want to save time, this is the way I recommend. 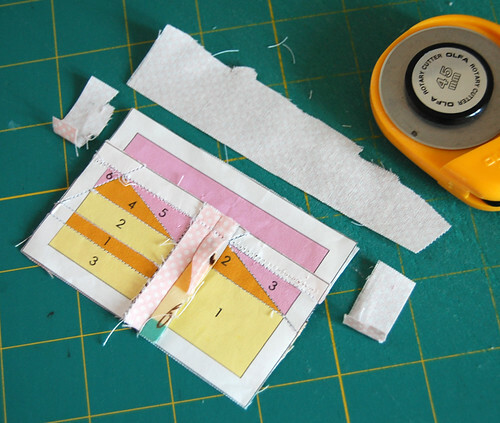 Then I used a rotary cutter and a ruler to cut off the excess. Bye! to the top piece template. With the paper still attached on the back of the cakes, I stuck pins like this. Then I stuck the pins on the back side of the paper template where indicated with red tick marks. The important part is here. These pins need to be up completely straight, which ensures that the cakes are just at the perfect spot. 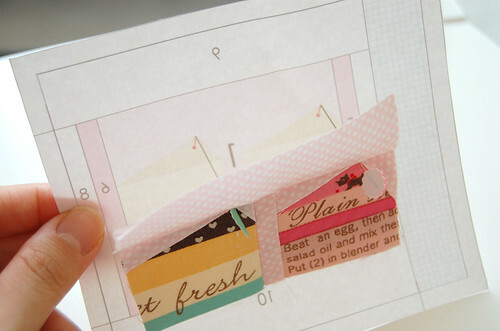 Then I glued all over the back of the paper template to temporarily attach the cakes at the right spot. 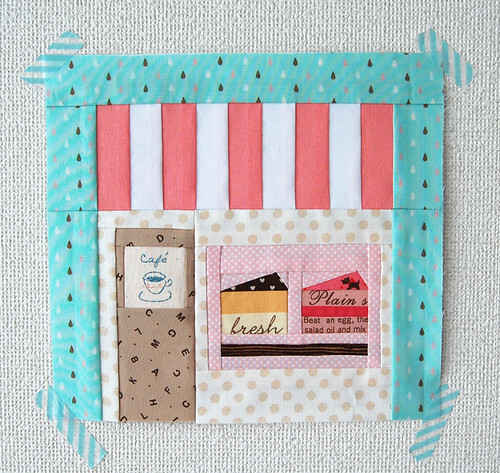 Thank you so much Kelly for making this QAL blocks available at superbuzzy and, thank you so much for all of you who might make any of these blocks. I hope you'll have lots of fun with these blocks and consider adding your pictures of your progress to this flickr group ;)!!! Have a great rest of the week! I'm off to stop by a little quilt show! Hi Ayumi..your blocks are so much fun just to look at. 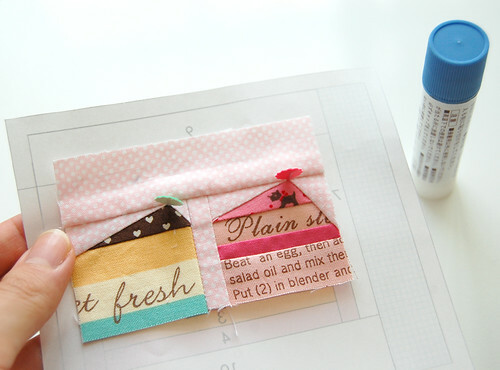 I admire your terrific mix of fabrics and skill at putting them together to look just right! You are amazing! Love these. So incredibly cute! You continue to amaze me! I love seeing what you can do with tiny pieces of material that all come together to make amazing blocks! You truly are talented and an artist in your own right! sooooo darling! I love that waitress! Cuteness unsurpassed. These are sooo cute! I just love all the details you put into these. Beautiful! Your are GENIUS! Your works don't stop to amaze me! I thought that penguin Popsicle is the best block ever, but I can see now that you haven't said your last word yet! Love these blocks...they are just perfect! Grabs chin, pushes mouth closed. That's me. These are jaw dropping gorgeous. Just like Julianna said, you are a GENIUS! These are wonderful, Ayumi! I bought all three months today. Crazy amazing! Apparently your creativity knows no bounds Ayumi. Another absolute A++ from you! Oooooh Ayumi these are so amazing!! So incredibly cute and perfectly executed. I love love love the expression on the face of the waitress! You are so clever!! Thank you so much for sharing that technique! I was doing blocks last week with sections like that and couldn't figure out a good way to add them on. NOw I know what to do! The chef and waitress blocks are genius. So much personality! I am constantly amazed! I just love the bnarrative behind each block too, each has a whole personality! You make everything you touch look amazing, Ayumi. 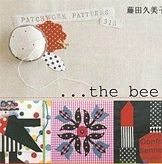 You have an incredible gift for translating a two dimensional design to paper piecing. It's like you see in geometric shapes! Aaackk! 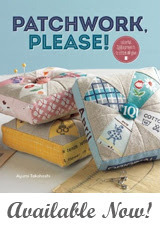 !, this is totally going to derail my "to do list" sewing for tonight! These are my favorite yet! Ayumi, those are adorable! Part of what makes your designs so appealing is your fabulous fabric choices! These are winners! Wow! I am in awe of your talent. 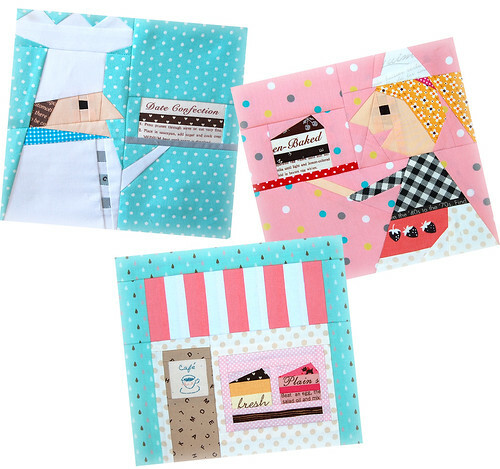 Hi Ayumi, I love the chef block it is so cute. 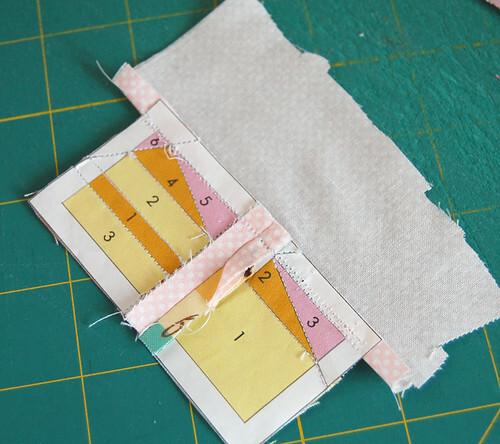 I always look at your paper piecing with so much admiration. 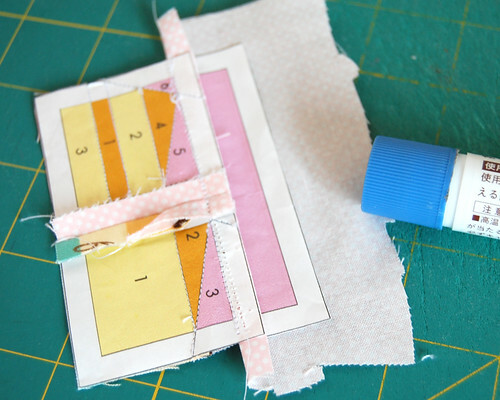 Paper piecing really intimidates me (that might be the reason I have never tried it). Thank you for inspiring us with your beautiful work! When I see your blocks I allways loose my words! 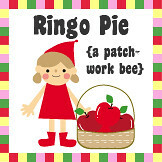 You are a BIG talent!This is adorable and amazing! I love the happy appearance of waitress.Thank you so much for sharing. These are so adorable. You always have an amazing combination of fabric that fills your blocks with such detail!! Wow, Ayumi, they are just AMAZING !!!! I LOVE them to pieces !!!!! Such a fun idea, love them! Wow, they look so good! Excellent work! These blocks keeps getting more and more amazing! Love them! Sua criação é belíssima, parabéns amiga! Ayumi...these are soooo super cute! 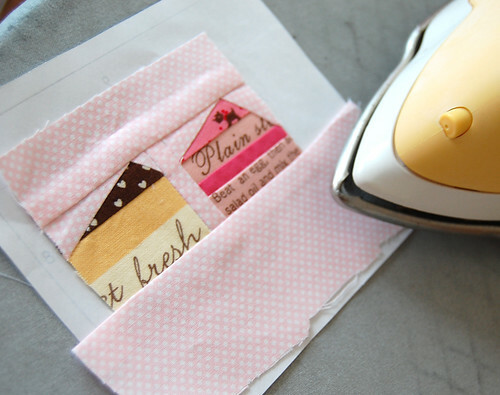 I have been so busy sewing with Polka Dot Stitches and getting ready for fall market that I havn't been able to make the dishy treats yet...and now the new one is here!...but you can bet they are first on my list as soon as I get a minute. I love all of the blocks so much Ayumi...this is going to be an incredible project. Thanks so much for doing it! Oh so darling! You have such an amazing eye for fabrics and color. It now is in my PDF folder!! Hope mine can be half as cute as yours! Another great set! I love the blocks and also the little stories you introduced them with. And as always, I admire your choice of fabric. j'adore ! j'aimerais tant savoir faire cela ! Ayumi, you are absolutely incredible. You have got to be one of the most talented people I've ever seen. That is such a sweet thing to say! Thank you! I somehow missed these blocks till now!! They are so adorable Ayumi! I can't decide if I like the chef or the waitress better. Terrific job! Gah! Cute heart attack! Marry me, chef! So cute...I can't resist, I will purchase them today. I love your talent. Adorable! I am still on the first block, but I'll get to these and the ice cream treats, eventually!